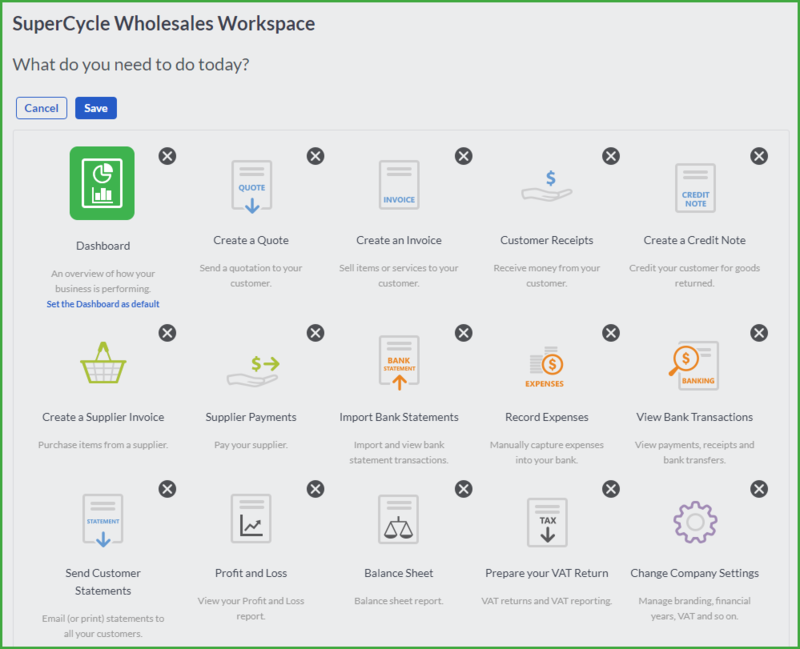 The To Do List shows due and overdue customer and supplier invoices, expiring and expired quotes and purchase orders and notes added from customers, suppliers, items, banks and credit cards, accounts and users. The Banking widget summarises your bank account activity and gives you an option to review your transactions. The balance that displays is in date and always display your current balance. It will also displays the date of your last Bank Statement import. Sales History shows a graph of total sales for this year, per month. You can access this function by selecting the Home menu option followed by the Dashboard option. You can drill down in each element of the main Company Dashboard either by clicking on the graphic or by clicking on the detail links. You can customise some of the elements for more information. For example, if you select Settings on the Sales History graph, you can select to include customer returns. The symbols on each view are described below. Use this tool to minimise the view. You will see only the heading bar for the view. Select the option again to maximise the view. This tool refreshes the view with any changes you have made. 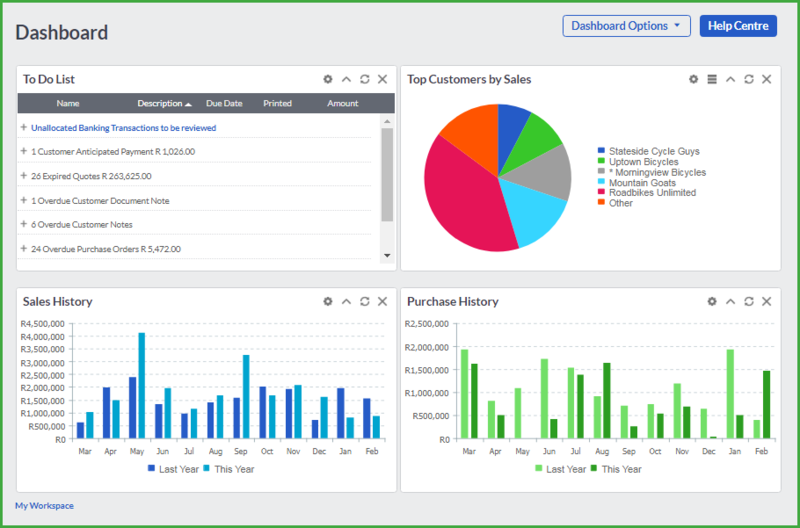 For example, if you edit the Sales History graph to include customer returns, you must refresh the view to show the new information. You can close a view by clicking on this tool. This tool does not close the view permanently. If you open the Dashboard again, the view will be back. If you want to remove a view, you must select the Add Widget option and unselect the view. Use this option to display your information in a chart format. Use this option to display your information in a table format. Should you want to add more “snapshot” screens to the main Company Dashboard, click on Dashboard Options followed by Add Widget and select the views that you want. You can unselect views by deselecting their boxes. Save your selection when you are finished. If you want to go back to the default dashboard settings, you can do so by clicking on the Reset Dashboard tab. You can access this function by selecting the Home menu option followed by the Customer Dashboard option. The customer dashboard displays all necessary customer related information. 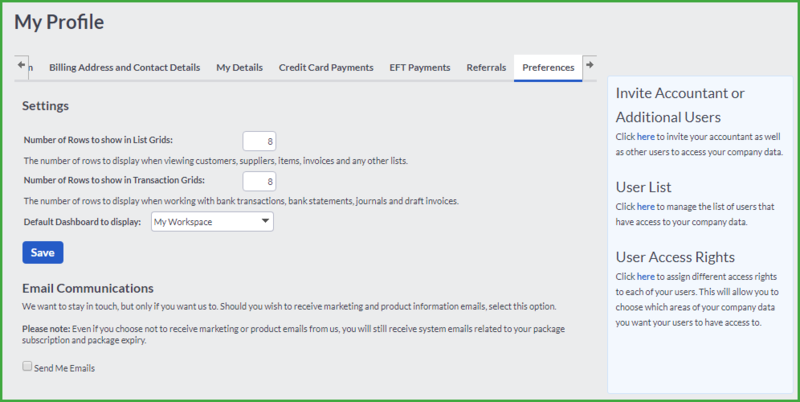 You can access this function by selecting the Home menu option followed by the Supplier Dashboard option. 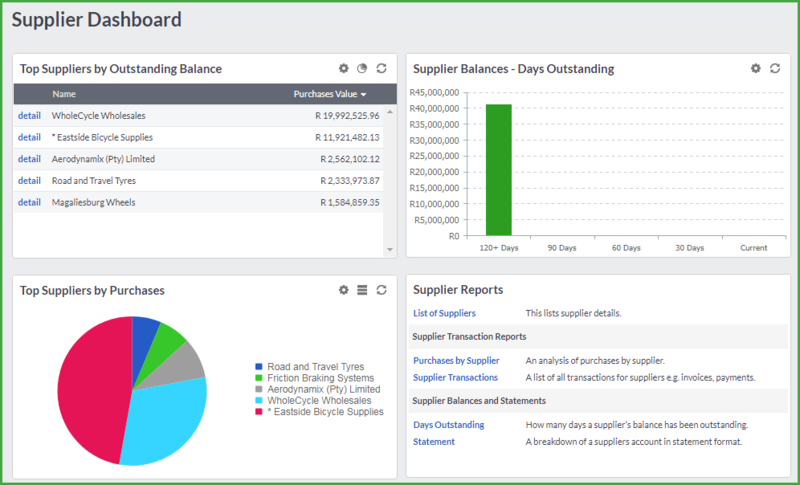 The supplier dashboard displays all necessary supplier related information. You can access this function by selecting the Home menu option followed by the Item Dashboard option. The item dashboard displays all necessary item related information. You can access this function by selecting the Home menu option followed by the Financial Dashboard option. 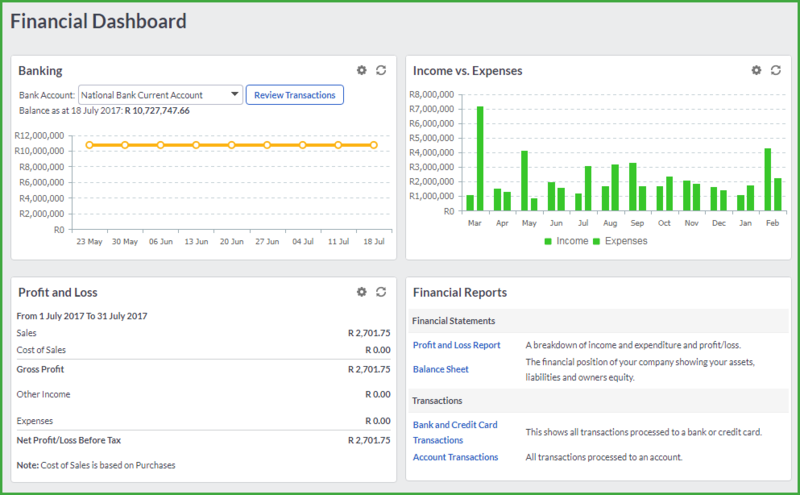 The financial dashboard displays all necessary financial related information such as your income versus your expenses, your profits and losses as well as the banking widget. 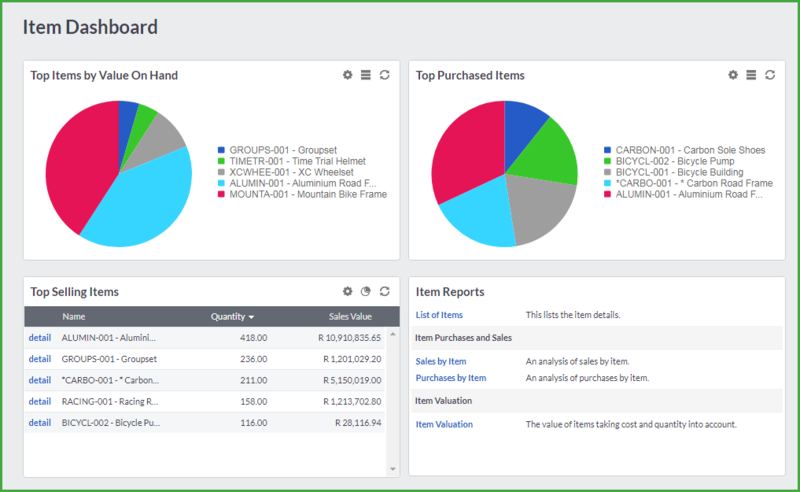 If you are an accountant, you will have another dashboard available for selection in the Home menu. 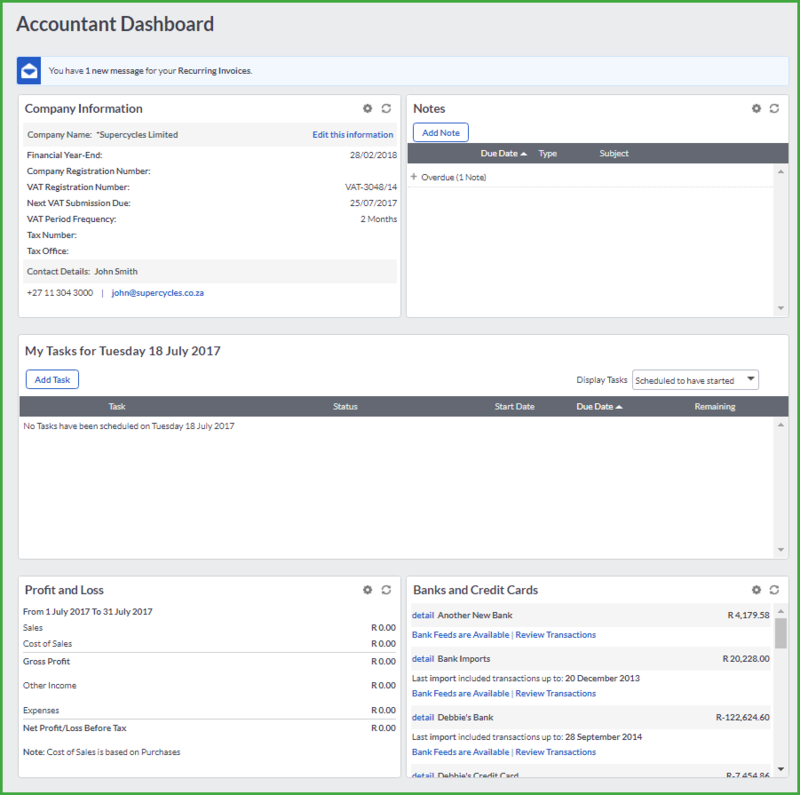 The Accountant Dashboard displays all necessary accountant related information such as the company tax information, your notes that was created and posted to you. You will see the Profit and Loss of the company and will also be able to set up Bank Feeds for the company through the Banks and Credit Cards widget. 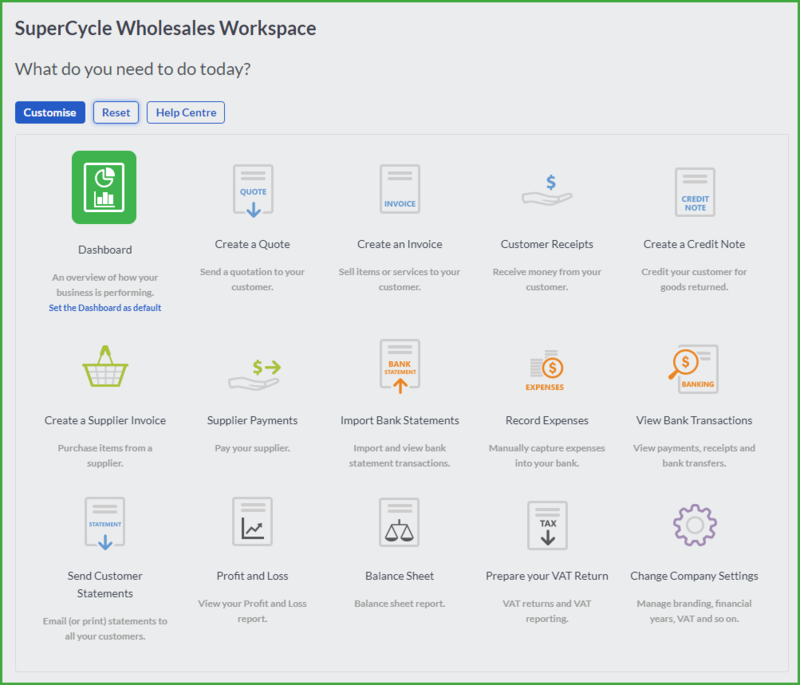 Accounting has a separate working area called the Workspace. Instead of selecting your dashboard you are allowed to view the My Workspace page. These are icons which will quickly link a user to the most important features in the software. You can customise the workspace to only include the functions that you need. Accounting allows you to even rename the heading and the details for each icon (link). You can also reset the original workspace and you can reset the Dashboard to be the default Home Page. You are able to include and remove whichever icons are most relevant to you. You can even drag and drop these icons onto different places on the screen. To customise your Workspace, click on the Customise button as indicated in the screen shot above. You can rename and add a different description to each of the icons. Simply click on the icon heading or icon detail and type in the information that you would like to display. Click on the green tick button to save. 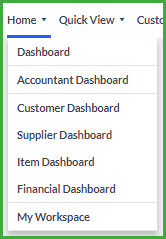 Only users have the option to choose the dashboard they want to display when logging into Accounting. To access this function, select the My Profile link at the top of the page followed by the Preferences tab. Select the Default Dashboard to display from the drop down menu. 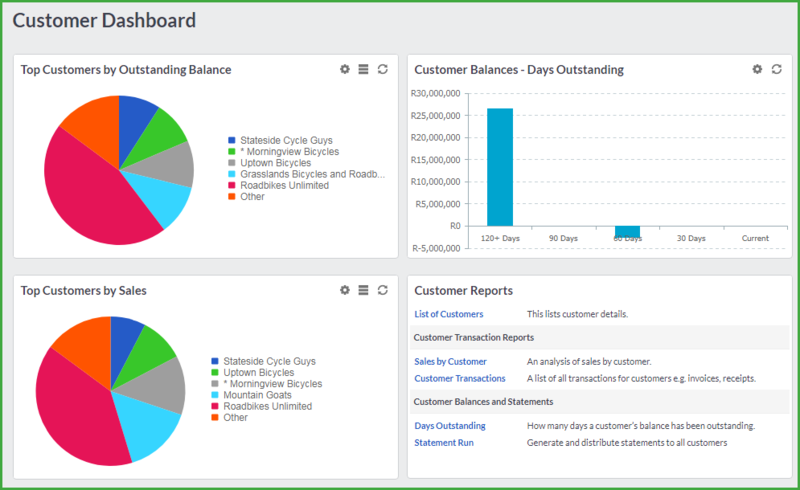 When you log into Accounting, the dashboard that you selected will display.